On Friday, we were informed that the FBI is reopening the probe into Hillary Clinton’s email scandal and her failure to protect our nations secrets. There are now so many Hillary Clinton scandals that the public can barely keep track of them. It appears that some of our government’s email to or from Hillary Clinton have found their way to the laptop of a true sleazebag, Democrat, Anthony Wiener. It appears that many in the leadership of the Democrat Party are corrupt. These people include President Obama who, in my opinion either knew or should have known that Mrs. Clinton was using an unsecure server and communicated with her over that server. Bill Clinton and the Clinton Foundation have been involved with some very questionable dealings. Bill was impeached, lost his law license, committed perjury, and paid out of court settlements of about 800 thousand dollars. Loretta Lynch had a clandestine meeting with Bill during a time when Bill’s wife was being investigated. Hillary has a list of corrupt activities that is too long to detail here. All of this is coming out right after huge increases in Obamacare premiums were announced. Let’s hope that the American people have finally had enough of the Clintons and their allies in the Democrat Party. The way that we stop this is to get to the ballot box and vote. Talk to your friends and family and get them to vote with you. This may be our last chance to get this Country back on track. Lets get this done. Right now, the mainstream media is pulling out all the stops to get Hillary elected. Unfortunately, in this Country, the liberal media no longer even pretends to be fair. They have droned on and on about some very bad words that Donald Trump said long ago. They have ignored Hillary’s lying, her total incompetence, and her attacks against women who accused her husband of assaulting them. The simple fact is that you cannot count on the mainstream media to report the news fairly and accurately. They want you to support someone who has been a part of the Obama team that has brought you some of the slowest economic growth in the history of our Country. A team that has brought you rioting in the streets and a disrespect for law and order. A team that has destroyed our international relationships to the point that a group of rebels under Iran’s direction feels free to fire missiles at our ships. A team that has brought us to 19.6 trillion dollars in debt. I understand that Trump’s words were bad. However, I hope you understand that a Hillary presidency will bring us open borders and unlimited illegal immigration, an ever expanding ISIS, an unlimited increase in our debt, restrictions on our constitutional rights, and the list goes on. Yes, Trump’s words were bad he has said that he regrets them. Isn’t it strange that the left seems to be absolutely okay with those words when they come from a Rap artist or one of their actor friends. Let’s get a sense of reality and compare what Donald Trump has said to what Hillary will do to our Country. This unprecedented partisan push by the media means that you have to fight even harder to make America great again. 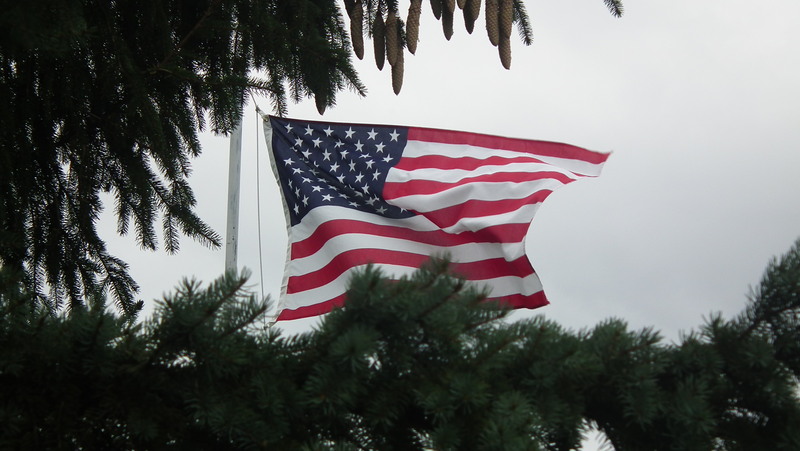 Talk with your relatives and friends about the freedoms you grew up with. Talk about what this election means for the future of this Country. We have to get the word out despite a dishonest media. We learned several things from the stellar performance of Mike Pence in last night’s Vice Presidential debate. The first thing we learned is that the American voters are not anxious to elect Hillary Clinton. They don’t want another four years of the utter failures of the Obama administration. We also learned that the people do not trust Hillary and they don’t want the Country to continue on it’s present course. If we stick to the issues, we can win. Our economy is sluggish at the very best. Our foreign relations are a disaster. We have riots in the streets. I’m convinced that the American people want change. Help get our message out by talking about the current state of our Country and the need for change. If we stay focused and work hard, we can stop the liberals from doing even more damage to this Country we love. The Trump / Pence yard signs are here and we are picking them up. The Trump / Pence campaign has only allotted a small number of yard signs for us. They intend to use most of their available funds on television advertising. Fortunately, the Fulton County Republican Party has purchased a significant number of signs. We hope that you will be able to make a small donation when you pick up your signs to help cover our costs. If you have requested a yard sign through this website, would you please email us again with your contact information. We will make arrangements for you to get your sign. We are trying to hold these signs for Fulton County residents only. Please also consider helping us by volunteering to work at our headquarters, which will be opening right after the fair, or by helping with the many other tasks which must be completed during a campaign. If you are enthusiastic about Trump, or other Republican candidates, please show it by volunteering. It seems that Hillary is creating a new scandal every day. If you think, as we do, that we need a change, please volunteer and work to accomplish it. In response to the many requests we are receiving about yard signs for Donald Trump, we have some updated information. The signs are on order and are due to be in our hands by August 22. That means that we should have them available in time for the Fulton County Fair. Shortly after the fair, we will be opening our headquarters, and the signs will be available there. We are pleased to see the great demand for Trump signs, and we hope that you will be willing to volunteer to help with the Trump campaign. It seems like everyday features another Clinton scandal or an even more obvious Clinton lie. We need to make sure that the voters know what a huge disaster Mrs. Clinton would be for the future of this Country. We are getting lots of requests for Donald Trump yard signs. Since the convention is recently completed, they are making new Trump / Pence signs. 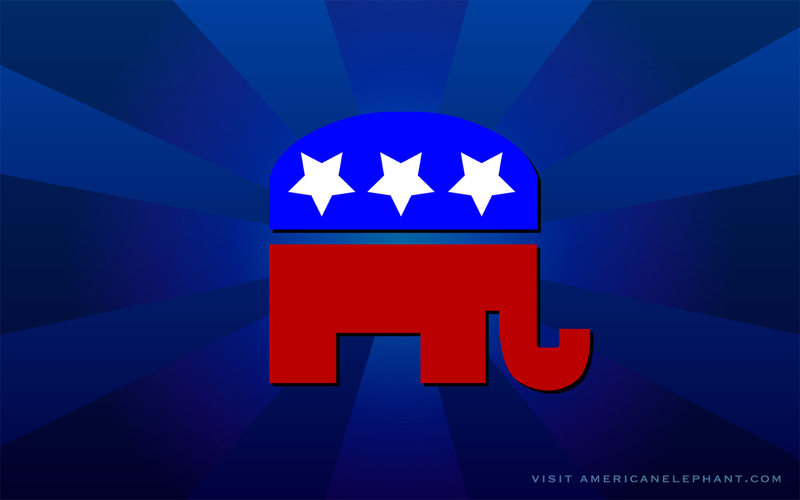 The signs that the Fulton County Republican Party receive will be distributed at no cost. We are hoping to start getting them in during the early part of August. The information will be posted when they are available. In the meantime, the Trump signs are available for purchase online. If you are interested you can go to the official Trump website by clicking on the following link www.donaldjtrump.com . 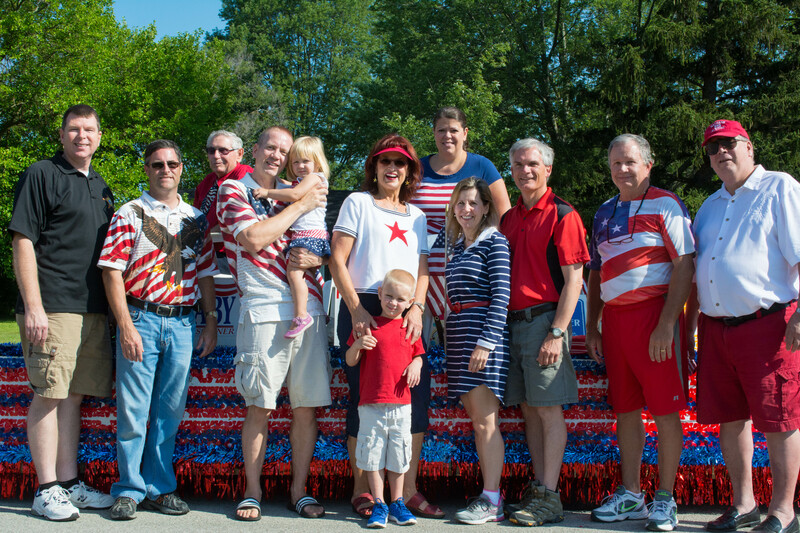 If you are an enthusiastic supporter of Donald Trump, or if you just can’t stand Hillary, we encourage you to contact us and volunteer to help out during the campaign. A Clinton Presidency would be a disaster for our Country. We hope you will join us in making sure that a Hillary Presidency never comes about. Here’s a shot you may enjoy from the recently completed GOP convention in Cleveland. 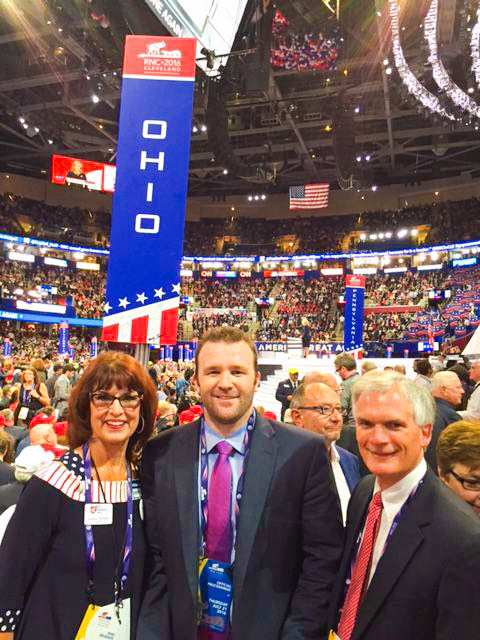 It features Brock Mealer who spoke at the convention on Thursday night. It was a great honor to be selected and Brock delivered a great speech. 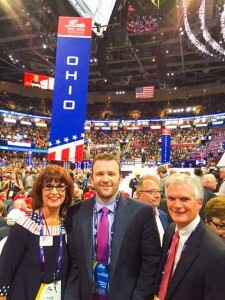 From left to right are Sandy Barber, Chairperson of the Fulton County Republican Party and Brock’s Aunt, Brock Mealer, and Congressman Bob Latta. If you are unable to click on this link, please copy and paste it. We are looking forward to this visit and hope to have many more visits by Mr. Trump and his family.